Leo Burnett celebrated a banner year in terms of its creative output and all the awards the global agency racked up—an Emmy for the "Like a Girl" campaign, 69 Cannes Lions and Adweek's Gravity Award for the Samsung Safety Truck, to name a few. 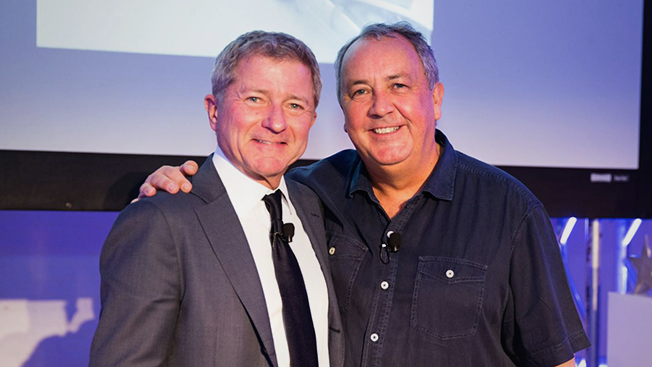 Outside all those creative wins, the agency's worldwide CEO Tom Bernardin and worldwide chief creative officer Mark Tutssel just reached the 10-year mark working together in their respective roles, and Tutssel celebrated 30 years in the Leo Burnett network. Tutssel and Bernardin spoke with Adweek about how they've built a successful agency together and how they've managed to help the network climb in the creative ranks in the past decade. Adweek: After working together for 10 years, what's been the key to maintaining a successful partnership? Mark Tutssel: We have a very strong human relationship. We like each other, and we have the utmost respect—mutual respect—for each other. But from a business point of view, we truly do subscribe to the same standards. We have exactly the same goal. And more importantly, we have a passionate belief in the power of creativity, and this is our shared focus and our shared passion. It's something we spoke about Day One, the first time we met as individuals, and we've spoken about that subject every single day for the last decade. It drives us forward, because at the end of the day, we are in the business of creativity, and our role is to not only solve marketing problems, we solve business problems today with class creativity. How long did it take for you to both be comfortable working together? Tom Bernardin: That was very early in the relationship because … we had common goals, and we supported each other. I think that Mark [Tutssel] knows that my whole career I've always had the back of the creatives. It was fast. I mean, there wasn't any big, long period of getting to know each other and getting to work successfully together. Tutssel: I think at the beginning, it was working together on real problems—on real business problems. And the first problem that we were confronted with together was the General Motors, Pontiac and Cadillac. We worked together literally day and night, night and day for two weeks in Detroit, producing a great campaign for the Super Bowl for that brand. So, this acid test is always working together on real problems in real time, and immediately you realize that you have so much in common, and you subscribe to exactly the same things. The relationship was hatched there and forged there and has continued to grow and flourish over the last decade. How has Leo Burnett evolved over the last decade? Bernardin: It's gone from … a relatively hierarchical organization … to a much more flat organization. It was an organization that was really managed almost entirely from people based in Chicago—which was OK at the time—to one now that is very geographically diverse. … It's a completely new world from a technology standpoint. We're living the dream at the moment in terms of that time in space where technology actually is able to connect us. Forget people, because people implies a roomful of people—we're now able to connect with the person. And that's what technology has enabled. The power of creativity to be tailor-made to that person and to be able to influence and hopefully invite people to participate in our clients' brands leads to the kind of participation and hopefully populism that then sells our clients' products. And that's the kind of dynamic change we love to see to the power of creativity to transform human behavior. Tutssel: Leo Burnett was one of the original Mad Men, alongside Bill Bernbach and David Ogilvy. He was really the founder of this industry we all now reside in. An interesting sideline here is Draper Daniels, who was one of Leo's art directors, is the real life character that Don Draper is based on. So, this is a very strong creative culture and an agency that truly believes in the power and potency and the value of great creative. Technology is changing everything, and we're seeing today … the alchemy of creativity and technology coming together to solve world problems. The brilliance of superb ideas is that they can change the world. A wonderful example of modern-day communication, which we would never have dreamt of a decade ago, is Samsung's Safety Truck. It was the perfect marriage cross section between technology and creativity, creating content that, you know, serves a really high purpose: in this case, saving lives. What are your greatest accomplishments at Leo Burnett? Bernardin: #LikeAGirl. … I'm so proud of that because of what it's done for our clients and then very personally what it's done for young women—what it says about women in general, having daughters myself. I'm proud of how diverse the agency is today in terms of a management team—how much our different regions around the world have grown over the years, both in creative reputation and then just sheer size, and how we've gone into different lines of revenue to help continue to have our company thrive in the future. I'm proud of the fact that we consider ourselves a creative-solutions company today, not just an advertising agency. Tutssel: I think for me personally, the most rewarding thing is doing our best creative work for our biggest clients. It's wonderful to see many of our clients pick up the Creative Marketer of the Year Award for creative excellence—clients who truly believe in the power of creativity, who use creativity to drive business success. Watching Coca-Cola, Procter & Gamble and McDonald's pick up that coveted award in the South of France is hugely gratifying, because the work that we've produced alongside many other great agencies has resulted in that accolade. More importantly, it's the brilliant ideas that not only drive business but change that world, and our best work is coveted by the best clients in the world. And right now, clients believe—passionately believe—that the primary asset of business is creativity. It's never been more valuable than it is right now. When I look at work like Coca-Cola's "Small World Machines," Always' "#LikeAGirl," Samsung's "Maestros Academy," Samsung's "Safety Truck," ABTO's "Bentley Burial," Vitória F.C. 's "My Blood is Red and Black"—all of those ideas are held up as new-world thinking. Ideas that really are challenging the status quo, defying the norms and really pointing a compass to the future. So, I love it personally when I see work that not only grows our clients' business, work that really moves the industry forward, and our best work is moving the industry forward.